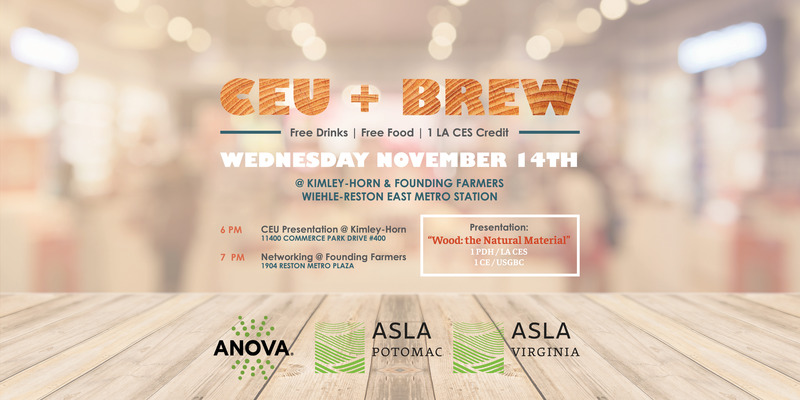 Join the Virginia and Potomac Chapters of ASLA for a fun and educational evening in Reston sponsored by Anova Furnishings! "Wood: The Natural Material" is a deep dive into the wood we use in products for construction and design. Through understanding the history and classification of our trees and woody plants, we can better make natural material selections that meet our ever changing needs in the design community. An understanding of common terminology like "hardwoods" vs. "softwoods" as well as what testing is done to wood products (e.g. Janka hardness test) can better help us create and design spaces that are safe, sustainable, and meet the needs of that space. METRO: Take the silver line to Wiehle-Reston East Station and make the short walk to Kimley Horn (11400 Commerce Park Dr #400). PARKING: Please park in the Founding Farmers garage at 11389 Reston Station Boulevard as the rates there are much lower than the Kimley Horn parking garage, which is unable to validate in the evening. At the garage, follow the signs for Retail Parking, located straight ahead through gates on G2 and G3. Take Elevator to P1 Plaza Level and walk across the pedestrian bridge to the Kimley Horn office. Valet is also available on the Plaza 7 days a week in front of Founding Farmers. Parking is validated for free by Founding Farmers for under 2 hours or $4.50 flat rate otherwise.